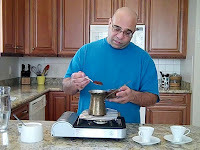 TheArmenianKitchen.com : The coffee's still boiling over! Our item on How To Make Armenian Coffee continues to draw interest. And the companion YouTube video continues to draw viewers -- it's far and away our most popular -- as well as comments, many of which I wouldn't repeat here. People apparently have really strong feelings about really strong coffee! The good news is most of those who've responded seem to love Armenian coffee. It brings back the sort of memories for them that it does for us, the warm feeling we get from making and eating all the recipes of our parents and grandparents. Reader Shant Meeroian, for one, remembers that his grandmother bought raw, green coffee beans because "they were cheaper." She roasted them until they were "almost brown/black but not black because then it's bitter." She ground the roasted beans into powder, and then added spices: "cardamom, baharat (allspice) and sometimes a pinch of cinnamon." What a heavenly smell -- and that's even before the coffee's on the stove. Thanks, Shant, for sharing that great memory! My grandparents were all long gone before my time, but I'd have to guess they roasted and pulverized their own beans, too. My father, the chief coffee maker in our house, bought the coffee already ground at the Armenian grocery store. He added no seasonings to the pot, but always placed a whole cardamom pod in each cup and poured the steaming coffee over it. I can smell it now -- or will soon. I'm heading to the kitchen for a coffee break. I *stil* use the brass grinder, because then I can buy organic fair trade coffee (from Trader Joe's, not the Armenian store). The way I figure it, it may take forever, but it saves me time at the gym.